Smoking cannabis can be a relaxing and fun thing to do, but when it comes time to clean your equipment that joy can quickly diminish. If you use a pipe, you know that it’s a rather delicate pieces of equipment to use. When it comes time to clean it the methods and techniques are similar to that of a bong, but pipes require a little more care. If you want to know how to clean pipes, keep reading. You’ll find plenty of helpful tips, ideas, and products you can use to help ensure your pipe is sparkling clean. A pipe works very simply. It’s just a small device that contains a bowl at the end (called the carb) where you place a slight amount of cannabis on. You can then use the hole at the other end of the pipe to breathe the smoke in. However, before you can do this you need to heat the cannabis up. You do so by taking a lighter and holding it under the pipe’s love until it starts to heat up. You can then start to inhale and exhale the smoke. Pipes come in all different shapes and sizes, especially materials. The material of the pipe can have a huge impact on the way you smoke and taste the cannabis. It can also affect the cleaning method that you use. Below is a little more about the different types and what you should know about them. Glass pipes are one of the most popular types to use for many reasons. One is that they come in a variety of colors and artwork. This can make using the pipe an even more fun thing to do. In addition to this, glass pipes also don’t tend to get very hot when in use so you won’t have to worry about it somehow melting or burning your hands. It also tends to give the cannabis a cleaner taste. However, glass pipes do have one downside and that’s that they’re easy to break. The glass can be very delicate and a bump against a table or using a certain product to clean it can be costly. Acrylic pipes are another popular choice because they tend to be very cheap. Made out of plastic, acrylic pipes are affordable models, but not the most durable. They can be very sensitive to cleaning products and the heat from the pipe could make some slightly melt. There are a few different materials metal pipes come in, two of the most popular being aluminum and brass. While durable, metal pipes do tend to get hot quickly so you’ll need to watch your hands when using one. Wood pipes are often a good choice for those who want a natural product to use. Made out of wood like bamboo, these can give an earthy flavor to the cannabis. However, the wood is very sensitive to cleaning solutions and can warp if it comes into contact with certain ones. Because of this, cleaning wood pipes can be a little time-consuming as you have to scrub them out by hand. It might not seem like it, but a dirty pipe can be a haven for germs and mold. When you smoke cannabis, a resin eventually starts to form and attaches itself to the pipe’s surface. If not removed, the resin can eventually start to not only give your pipe a nasty brown color, but can cause you to cough excessively when you’re smoking because the resin goes into your lungs. Besides this, a dirty pipe can smell very bad and mold can eventually grow in water and other liquids left behind in it. 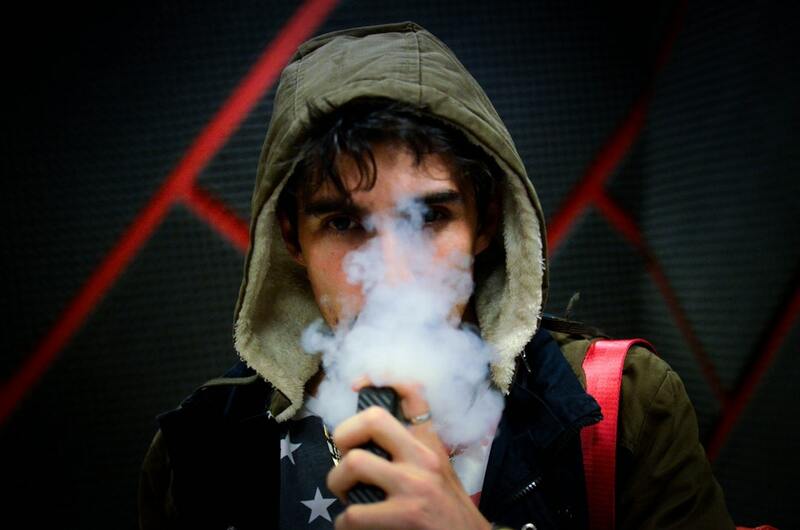 If you share your pipe it can also collect many germs if not wiped off after being used. Cleaning a pipe requires a few materials but they are very affordable and easy to use. Below are some vital materials you’ll want to have on hand. This is a common sanitizer used when it comes to cleaning bongs and pipes. The isopropyl alcohol has special components in it which work to quickly kill any germs and bacteria. However, it’s important to not overuse this. It’s not a good idea to consume this alcohol and pouring cups of it into your pipe isn’t good. When cleaning your pipe it’s important to be moderate with the amount so you aren’t consuming any traces of it. Cotton balls are very helpful when it comes to removing resin and other substances from the pipe’s surface. Because they are soft and able to get into various angles, cotton balls are perfect for removing large patches of dirty materials in your pipe. Cotton balls might be helpful at getting large materials out, but cotton swabs help to give your pipe a more intricate clean. 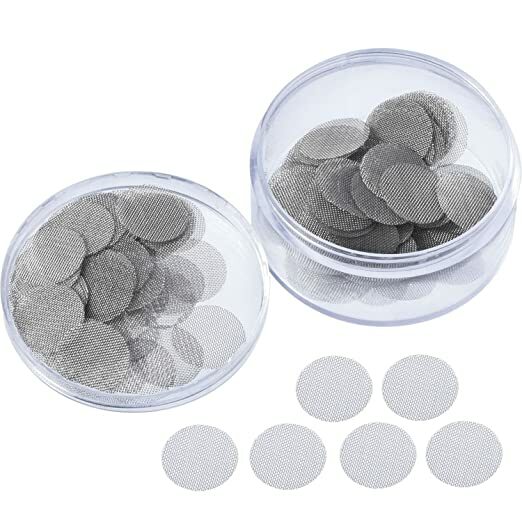 These are small enough to get into the pipe’s crevices and are tough enough to help break up hard buildup without damaging your pipe’s surface. Salt is a crucial material to have when cleaning a pipe. It’s what helps to absorb the cleaning agent you use so no traces of it are left behind. It also works well at cleaning the pipe out so you’ll want to make sure to have a supply of this on hand. Lemon juice can not only give a fresh citrus smell to your pipe, but it can help to give it a shine and break up buildup inside as well. As an important natural pipe cleaner, hot water will help to instantly kill bacteria and germs in your pipe. Soaking some pieces in it will help the water to reach into even the smallest of crevices so nothing gets left behind. A toothbrush can work alongside cotton swabs to get hard buildup out. If you have certain pipes, like bamboo ones, you’ll definitely want to have a toothbrush available in order to delicately scrub out the resin inside without damaging the wood. The bristles of the toothbrush are tough and can get into crevices that would otherwise be missed by things like cottons swabs and cotton balls. A pipe cleaner is a special combination of substances that work to quickly remove resin and other things from your pipe. While they each are made with the same purpose, they each have their own unique formula. Some work quicker than others while others take a little longer but give the pipe a deep clean. It’s important to use a pipe cleaner but you want to keep little things like this in mind so you invest in the right one. A clean cloth or paper towel can help you to wipe out the pipe and dry it. They both can work well at soaking up any liquids left behind so your pipe is dry and fully clean. Better yet, these materials tend to be very affordable so they’re good to invest in. To help protect your hands from possible cleaning chemicals and sticky resin it’s a good idea to wear some gloves. While you don’t have to wear them, gloves can protect your hands from some nasty substances which is very helpful. Many brushes have been created to help with cleaning pipes. They have strong bristles that can help to break down buildup but are soft enough to prevent damages to your pipe’s surface. A good brush product to try is the Pro Products Mini Brushes. 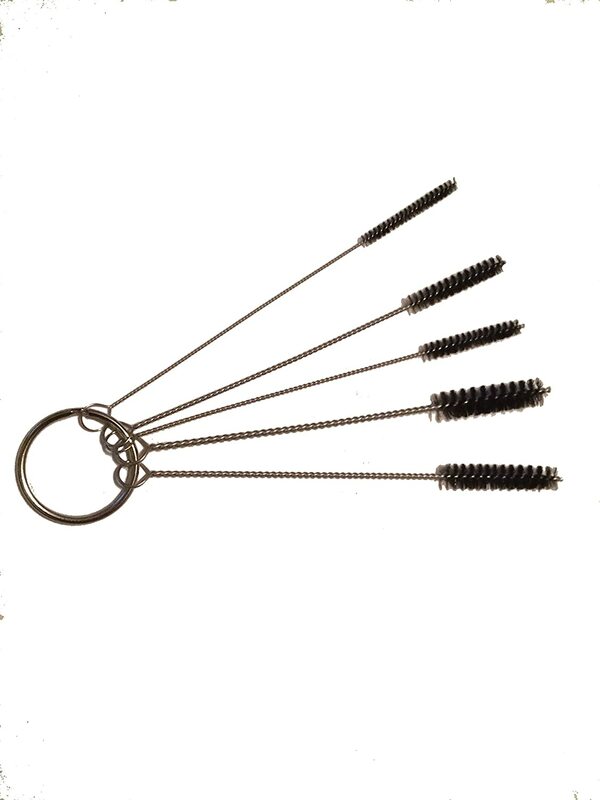 These small brushes are stuck together on a metal keychain to help prevent them from getting lost and come in a variety of sizes. They are made with a strong nylon bristle to help get into the pipe’s crevices. 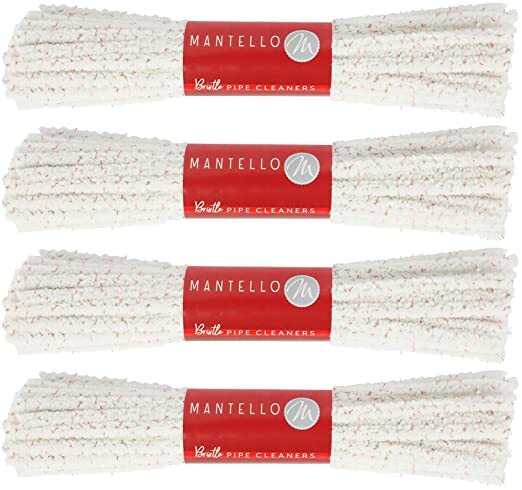 Another product you can try is Mantello Pipe Cleaners. These come in a bundle of 4 durable brushes that have a total of 44 cleaners in each. They measure 6 inches long and feature a tough bristle on the end to help quickly remove buildup from your pipe. They’re also very flexible so you’ll be able to move them around in different angles to clean various pipe parts. There are many different cleaning methods you can use when it comes to your pipe. However, there is one main way that it can be done. The first step to cleaning a pipe is to try to scrape out and remove as much resin and buildup as possible. This will help to make cleaning it much easier. You can use a pipe scraper or even cut off a cotton swab top and use its tough stick to help scrape the resin off. While not always necessary it’s still a good idea to let the pipe soak in some hot water. This will allow it to remove bacteria and germs that might be missed by a cleaning solution. Make sure the water is hot though or the germs won’t be destroyed. After soaking it in water, try to put some cleaning solution into the pipe to help break up the resin and germs in it even more. Salt is also very helpful when it comes to absorbing the chemicals in the solution so they don’t get left behind. Just pour a tad bit of cleaning solution into your pipe and about a tablespoon of salt into it to help. After doing this plug any opening on the pipe up to prevent the liquid from escaping. After doing so, shake the pipe up gently so the cleaning solution gets into all the crevices. Once you shake the pipe gently to clean it you’ll then want to pour the cleaner out and rinse it with warm water. Keep doing this until all traces of the cleaning solution and salt have been removed. This might take a few minutes to do but it’s important to ensure all traces of the cleaning liquid are gone. After rinsing your pipe out, dry it off carefully with a clean towel or paper towel. You then can let it rest in a clean area to air dry. Air drying is ideal to help the interior of the pipe dry so you don’t somehow end up damaging this delicate product when trying to dry it. If you plan to use this method with glass pipes you can use a cleaning solution like Grunge Off Super Soaker. 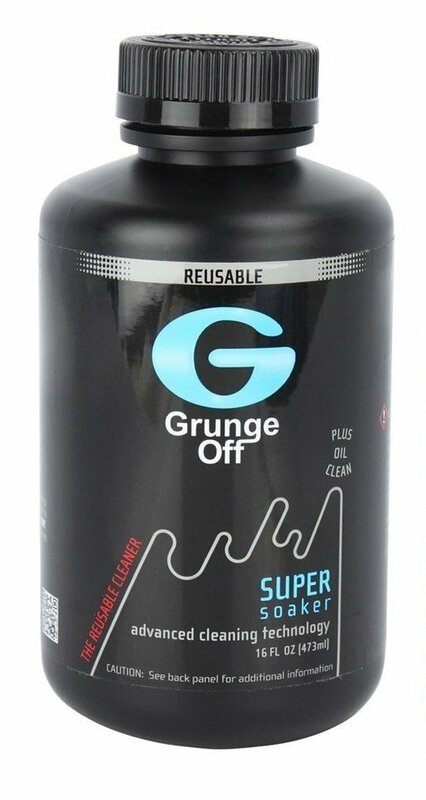 This liquid cleaner comes in a 16 oz. bottle and requires no shaking in order to work well. Besides removing resin, it also works to remove odors inside the pipe. 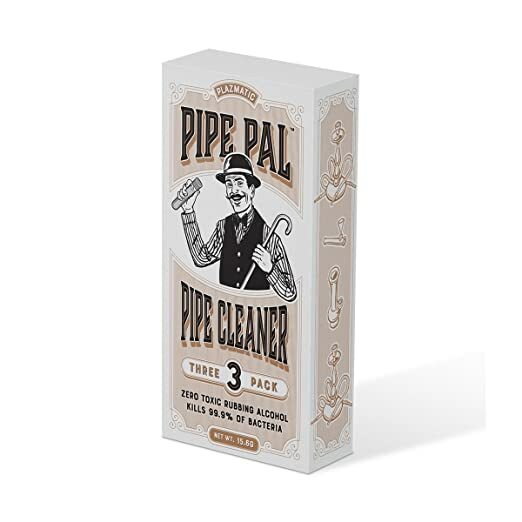 Better yet, this liquid cleaner is made with eco-friendly materials so you won’t have to worry about putting harmful chemicals into your pipe. Another great option to try is the Plazmatic Pipe Cleaner. This eco-friendly choice works quickly and doesn’t require any shaking beforehand. It comes in a package of 3 tubes. If you’re not keen on the idea of using a cleaning solution you can instead try the denture tablet method. This is a simple method to use when it comes to cleaning out pipes, but doesn’t always give the most intricate clean. You’ll want to first find a clean container to keep your pipe in and fill it with warm water. Make sure the container is full, but not all the way filled to the top. After filling the container with water, take your pipe and gently drop it into it. Then, take about 2 denture tablets and put them into the water. Once you do so you’ll see these tablets instantly dissolve and get to work removing buildup on the pipe. After you put the tablets into the water let it sit for a few minutes to ensure the tablets work to remove as much buildup as possible. It’s a good idea to wait about 10-15 minutes for this. Once the time is up, carefully take your pipe out the water. Once you remove the pipe from the water try to shake off as much of the excess water as possible. This can not only help to prevent you from making a mess, but will work to remove any extra water inside the pipe that could otherwise make it difficult for it to dry. After removing the pipe from the water, take a clean cloth and wipe it off. Just like with the other cleaning method mentioned above, it’s best to let the pipe air dry for a bit to prevent accidentally damaging it when drying it off. This should take about an hour or so for the pipe to fully dry. One of the best ways you can keep your pipe clean and working for a long time is by giving it a daily clean. By just rinsing it out with some water, it will help to remove any resin created and cannabis particles left behind. This can prevent you from having to do time-consuming cleans often. While you use pipe cleaners and isopropyl alcohol to clean your pipe, using them often can eventually take a toll on your health. It’s not good for you to consume these products even if it’s just small traces accidentally left behind from cleaning. You want to try to use natural cleaners, like vinegar and lemon juice, to clean your pipe out. To clean your pipe out with natural materials like vinegar or baking soda, you just need to clean it out exactly as the cleaning solution methods written about above. However, don’t put too much of the vinegar or baking soda into the pipe or it could end up causing a mess. It can be very easy to overspend on cleaning materials for your pipe. However, it’s important not to do so. While many cleaning products will market themselves as being the only way to clean a pipe, you can do the same exact thing they claim to do with just paper towels and water. The materials mentioned above are really the only things you need to use to successfully clean a pipe. When cleaning your pipe always be gentle. These are delicate products and scrubbing them too hard or letting them sit for an extended period in a cleaning solution can be very damaging. So, always take care when cleaning it. Water can help to clean out your pipe, but only boiling water will destroy germs. Because of this, it’s important to use boiling water with your pipe as much as you safely can. Sometimes you can even drop your pipe into a pot of boiling water to help clean it. However, this can be a very tricky thing to do so it’s a good idea not to try that unless you really know what you’re doing. Otherwise, your pipe could end up breaking. A unique way to help remove extremely hard buildup from your pipe is to put it into the freezer for about 15 minutes. Any resin inside it will inside harden which will make it easier for you to scrap it off. If you want to try this, you’ll want to make sure your pipe stays in the freezer for about 15-30 minutes. However, be careful that you don’t keep it in the freezer for too long or the frigid temperatures could cause your pipe to crack or become damaged. Keep in mind though that freezing the pipe doesn’t automatically clean it. This just helps to make the buildup harder so it’s easier to remove from the pipe. You’ll still need to use a cleaning method to sanitize it. To help prevent yourself from inhaling particles when using your pipe and to help give yourself an easier time cleaning this device, it’s a good idea to consider investing in a screen. Screens come in many different types of materials (the two most popular being steel and brass) and prevent the pipe from becoming blocked and filled with tough resin. They often come in many different sizes as well so they fit a variety of pipe types. Steel screens are extremely durable ones to invest in, but they do have a few drawbacks. They’re not good to use with glass pipes and need to be cleaned regularly. However, they do last for a long time which is a plus. If you’re looking to use a steel screen you should check out the Mudder Stainless Steel Pipe Screens. These screens measure ¾ inches across and come in a pack of 150 pieces. They have a universal fitting feature so they will easily attach to any type of pipe. They are reusable and can be cleaned easily without fear of them rusting. The screens also come with a special storage box you can use to keep them safe and dust-free. Unlike steel screens, brass screens are great to use with glass pipes. They tend to be very flexible so they can adjust easily to different pipe types and also don’t scratch easily which is ideal. A great brass screen product to try is the Grimm Brass Screens. 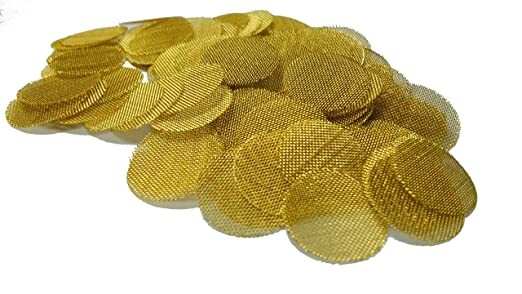 These screens come in a ¾ inch diameter and in a pack of 50. They are very easy to install and can be taken out and exchanged for a clean screen quickly. They’re also extremely affordable. Cleaning a pipe isn’t difficult and can help it to stay clean and working for a long time. 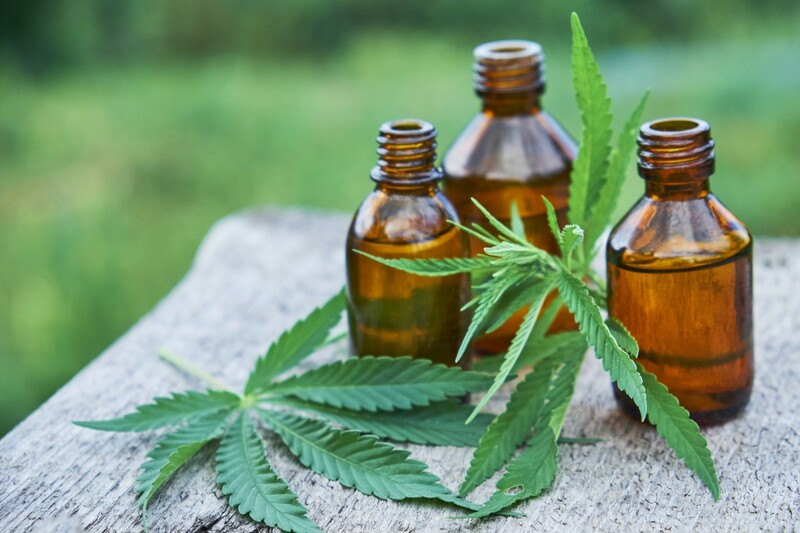 By using the materials above and following the “how to clean pipes” cleaning methods mentioned, you’ll be well on your way to successfully cleaning your cannabis pipe.